Impulse: Just because you walk into a busy, bright, and productive looking office doesn’t mean all the agents who work there are also busy, bright and productive. Take the time to get to know the agents you’re considering working with. Interview them, like you would any other professional you hire, to determine their abilities and knowledge of the community in which you want to live. Easy Agreement: If you finally find an agent who instantly agrees with everything you have to say about the selling price of your home without question, beware. This is especially true if you’ve been to others who disagreed with your price. Consider why this one agent is so agreeable. As in any industry, there are people out there who will tell you anything you want to hear to get your business. Trusting Your Judgment: While you may very well be a great judge of character, make sure you get at least three references from all the Bloomfield Hills real estate agents you’re considering. Then, take the most crucial step and contact those references. These are just a few of the considerations when choosing a Bloomfield Hills real estate agent, but they will get you started on firm footing. If you’re looking for a knowledgeable Bloomfield Hills real estate agent, I’d be honored if you’d interview me. To schedule an interview, call me today at 248-514-2640 or email me at info@NorthWoodwardHomes.com. Buying Real Estate in Southeast Michigan – You Did WHAT? If you’re still trying to decide if buying real estate in southeast Michigan is for you, consider all the reasons why people are still buying homes. Once you buy a house, it’s yours until you decide to sell it. You experience pride of ownership. There’s also a sense of security in owning your own home, which is something missing in renting. Mortgage rates hit an all-time low, which became a big incentive for some buyers. Potential buyers looked at the interest rates and figured they could never get a better deal on a mortgage. Home prices are lower too. Yes, the media says home prices may decline more, but the key word is “may.” The experts can predict all they want, but you don’t know for sure until it happens. Some first-time buyers looked at the prices, weighed their decision on “what if the prices start rising again” and signed the deal. What about you? If you’re looking at the possibility of buying real estate in southeast Michigan, what would get you to sign on the dotted line? Put your requirements and goals in writing, and make them realistic. When all the cards are right, there’s nothing left to do but play your hand. If you’re looking for a great property to own, I can help. Call me at 248-514-2640 or email me at info@NorthWoodwardHomes.com. There is no simple way to discover which home-improvement projects will yield the highest return when you’re ready to sell your home. There are many variables that come into play such as the state of the real estate market when you put your Royal Oak Michigan home up for sale, how old your home is, and the style of your home. Buyers expect a well-maintained yard; they don’t expect the home’s value to increase because of it. Beautiful landscaping may encourage potential buyers to take a closer look at your Royal Oak Michigan home for sale, but it most likely will not add to the selling price. If a buyer is unable or unwilling to put in the effort to maintain an elaborate garden, it becomes a negative feature rather than a positive one. A swimming pool seems like fun to have, but can actually be more of a hassle than a pleasure. Many potential buyers consider swimming pools expensive and time consuming to maintain. Buyers may say no to an otherwise perfect house if it has a pool. Or, they may include in the contract a stipulation that the seller has to take down an above-ground pool or fill in an in-ground pool, at their own expense, before closing. Buyers don’t want to see the absolute cheapest renovations in a Royal Oak Michigan home for sale, but they also don’t want to pay more for the highest-priced upgrades that they don’t need. Marble countertops in a kitchen and a built-in sauna in a bathroom are nice, but unless you have a high-end home in a high-end neighborhood, don’t expect to get your money back from these upgrades. Don’t spend thousands of dollars on a home-improvement project that will not increase your home’s value when it comes time to sell. Do spend money on projects that will make your home a wonderful place to live in now and that may increase the selling price when you’re ready to sell. Are you ready to sell your home? I can help. Give me a call today at 248-514-2640 or email me at info@NorthWoodwardHomes.com. Do you own Troy Michigan real estate with a small room that’d you’d like to make larger, but you don’t have the money in your budget to tear down a wall or add on to the room? By using a bit of creativity, you can make that tiny room look larger without breaking the bank. 1. Leave open space. Place taller pieces of furniture along a wall rather than out in the open space. To prevent blocking the view into a room, use shorter pieces of furniture like an ottoman or a low table. The more open space you can see, the larger the room will look. 2. Brighten the room. A well-lit room looks larger, whether it’s brightened with natural or artificial light. Remove heavy, dark draperies to let the natural light into the room. Install track lighting or recessed spot lighting, which is perfect for a small space. 3. Lighten up the floor and ceiling. Open up the room by using a white or very light color on the ceiling. Use light-colored flooring such as light oak or a light-colored carpet to make the room appear bigger. 4. Reduce the amount of furniture. This goes back to leaving open space. Keep only those pieces of furniture that you really love or really need in the room. Get rid of everything else. 5. Switch to glass. Using a glass-topped dining table, end table or coffee table gives the appearance of an open space, even though there isn’t. 6. De-clutter. Too much stuff makes even a large room seem small. Organize anything you must keep. 7. Choose light colors. Light, cool colors like pale blue and light green can make the smallest space feel open and airy. 8. Use a monochromatic scheme. Take those light colors one step further by using colors all in the same family. When you look around a room that has the same color scheme for the furniture, flooring and walls, you believe there’s more space than there really is. Contrasting colors break up a space. Furniture is less interrupting and blends with the space if its color matches the wall. 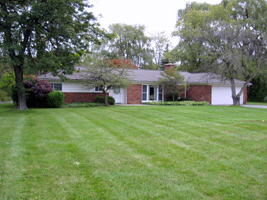 Are you looking for Troy Michigan real estate with large rooms? I can help. Give me a call today at 248-514-2640 or email me at info@NorthWoodwardHomes.com. Unless elaborate decorations, gourmet food and mountains of mess are your idea of fun, I have some suggestions for you on how to make your holidays simpler and less stressful this year. If it flashes or makes a noise, just say no. Decorations like that increase stress. Display only your most treasured items. Decorate only those rooms in your Bloomfield Hills home that are used during celebrations. Instead of filling every inch of a room with decorations, use fewer items and group them in noticeable spots around the room. Spending less time decorating your Bloomfield Hills home gives you more time for your friends and family. It also means wasting less time after the holidays putting away all those decorations. It’s not necessary to spend a lot of money on food or entertainment in order to have a good time. Some of my most enjoyable gatherings were spent listening to holiday music, playing games and eating a bowl of popcorn with friends and family. Don’t cook all the food yourself. Host a potluck party or pick up already prepared food from your local grocery store. Reduce the number of guests. Do you really need to invite the entire neighborhood? Invite only those few who you sincerely want to spend some time visiting with. Send electronic invitations. It’s free, fast, easy and fun. The holidays aren’t about your house, food or furniture. They’re about your heart. Open your heart, relax and truly enjoy your loved ones this holiday season. Happy Holidays! Unfortunately, the winter holidays are peak times for thieves and burglars. Not only are burglaries of Bloomfield Hills homes at their highest during the darkest months of the year, there’s also the added temptation of unoccupied Bloomfield Hills homes full of expensive gifts. A recent survey found that 39% of homeowners leave presents under the tree long before Christmas Day, with only 7% of respondents waiting until Christmas Day itself to put the presents on display in their Bloomfield Hills homes. If gifts are in full view of passers-by who can see them through the windows, they could provide an incentive for thieves to target the house. 1. Take greater security measures during the holidays to keep yourself and your property safe. 2. Don’t hide presents in obvious locations such as closets, under the bed or in the garage. Instead, hide gifts in an attic. The average burglar doesn’t have time to climb into your attic. 3. Keep window shades drawn. If your gifts are easily visible from the street, burglars will be tempted to smash the window and grab the wrapped packages. 4. Don’t discard whole boxes in your trash. This gives thieves easy clues about what they can steal from your home. Instead, break the boxes up into small pieces and place them in your recycling bin or at the bottom of a sealed garbage bag. 5. Create a lived in look and feel. Before leaving your home, turn on lights and a radio or television. 6. Ask a neighbor or close friend to pick up your mail and newspapers if you go out of town for the holidays. 7. Lock up. Make sure all doors and windows are locked. Consider replacing your locks if they’re worn. Use deadbolts in entry doors. 8. Keep the garage, gates, driveway, and sides of your home well lit. Motion sensor lights work well for this. If you’re looking for a home already equipped with an alarm system or other security features, I can help you find one. Call me at 248-514-2640 or email me at info@NorthWoodwardHomes.com. Not all real estate agents have experience in buying foreclosures for sale in southeast Michigan. If you have a professional agent on your side who understands the process, you’re one step ahead of the game. Like all real estate you’re considering buying, it’s important to inspect a potential foreclosure purchase. The former residents most likely didn’t move out under favorable conditions, and it is often reflected inside the home. Before buying the home, carefully consider any repairs you will have to make. Add the cost of all repairs needed into the price of the foreclosure. Then, determine if the property is really a bargain. Also consider the price of the home. Just because it’s a foreclosure doesn’t automatically mean it’s a bargain. With the fluctuation in real estate prices, homes that were priced high when they were for sale before foreclosure might still be over priced as a foreclosed property. Make sure you and your real estate agent carefully research the market and determine if this is a true bargain. Your bank will check your background, credit, etc; you need to do the same in regards to your prospective purchase. Homes that have been repossessed may also carry encumbrances on the title from past debts the previous owner incurred. Don’t let yourself fall into a nasty surprise. Check to ensure there are no liens or encumbrances on the title before purchasing the property. As a licensed real estate lawyer, I can easily determine if there is anything that might cost you thousands of dollars if you purchase the wrong property. If you would like more information on buying foreclosures for sale in southeast Michigan, give me a call today at 248-514-2640 or email me at info@NorthWoodwardHomes.com. At this time of year, we typically don’t think a lot about safety. We’re all too busy running around shopping and decorating our Bloomfield Hills homes. 1. Never use lighted candles on a Christmas tree, whether it’s an artificial or live tree. 2. Purchase artificial trees with a Fire Resistant label. This label doesn’t mean the tree can’t catch fire; it means the tree will resist burning and should extinguish quickly. 3. Check for freshness when purchasing a live tree. Needles that are hard to pull away from branches and that do not break when bent indicate a fresh tree. Sticky resin on the tree’s trunk is another sign that a tree is still fresh. Old trees can be fire hazards in Bloomfield Hills homes. 4. Chop a few inches off the trunk of your tree to expose the fresh wood. This allows for better water absorption and will help to keep your tree from drying out and becoming a fire hazard. Water your tree regularly. 5. Avoid sharp or easily breakable decorations and small, removable items that children can swallow. Eliminate decorations that look like food or candy. Children may try to eat them. 6. Limit the number of standard-size light sets plugged into one extension cord to three. 7. Turn off all Christmas tree lights before you go to bed or leave your home. The lights could short out and start a fire. 8. Don’t burn wrapping papers in your Bloomfield Hills home’s fireplace. A flash fire may result, as wrappings ignite suddenly and burn intensely. 9. Remove all greens, boughs, papers, and other decorations from around the fireplace before lighting a fire. 10. Check labels on lights you’re planning to use outside to be sure they’re certified for outdoor use. I hope you and your family have a very Merry (and safe) Christmas! Those who have never had homes for sale in Southeast Michigan before often think selling is as simple as hiring an agent and putting a sign in the yard. It’s not, however, as you’ll soon discover. The exterior of homes for sale in Southeast Michigan is the first up-close impression buyers get. So, when buyers make it inside, they’re one step closer to actually buying. However, if the interior is a mess, it could blow the whole deal. While each of the homes for sale in Southeast Michigan is unique, with different selling points and selling problems, this list is a good start for any home.